Posted on March 16, 2017 by Lea S.
One of my very favorite Georges Méliès films is Les Quat’Cents Farces du diable, literally translated as The 400 Tricks of the Devil. We just call it The Merry Frolics of Satan (1906), which is a title truly of its time. So is the film itself, but that’s why I love it so much. Returning home, Crackford tries out some of the pills in front of his family, which results in the house becoming filled with magical servants who bundle the Crackford family into trunks and turn the trunks into a tiny, magical train (you’ll just have to watch the film). Crackford happily drives off–the journey around the world has begun! The train doesn’t last long, however (plus the townspeople make fun of the silly thing) and Crackford and his assistant decide to stop at an inn. Unfortunately, it’s run by Mephistopheles, who wreaks havoc until the two flee in a horse and buggy. Mephistopheles transforms their buggy into a “infermal carriage” pulled by a strange, skeletal horse, and chases them to the summit of a volcano. An eruption blows their carriage into space, where they continue their bizarre journey among the stars and planets. That glorious, surreal ride through star-spangled space! The sight of that skeletal horse-puppet with his legs swinging away is enough to cure any blues, in my opinion. …Méliès, unfortunately, also seemed to be relying more on theatrical tricks and less on cinematic ones as he had in his earlier spectacles. Stop-substitution splices and multiple-exposure photography remained the basis for his single-scene trick films, but his longer multi-scene fantasy adventures seemed to be becoming increasingly theatrical. The preference to use trap doors in this film instead of stop-motion and editing for appearances and disappearances seems to evidence this increased theatricality. A fair review. Méliès did seem to fall back on familiar stage tricks as the years went by. But did Merry Frolics spring forth entirely from Méliès’s imagination? Were there other reasons he might’ve wanted to be more theatrical than cinematic? A little research reveals that the film is indebted to a stage play–and was part of one, in fact. Les Pilules du diable, a féerie play, was first released on February 16, 1839. It became a popular classic, revived often throughout the 19th century. In 1905 Victor de Cottens, director for the famous Paris music hall Folies Bergère, staged Les Pilules du diable at the Théâtre du Châtelet. 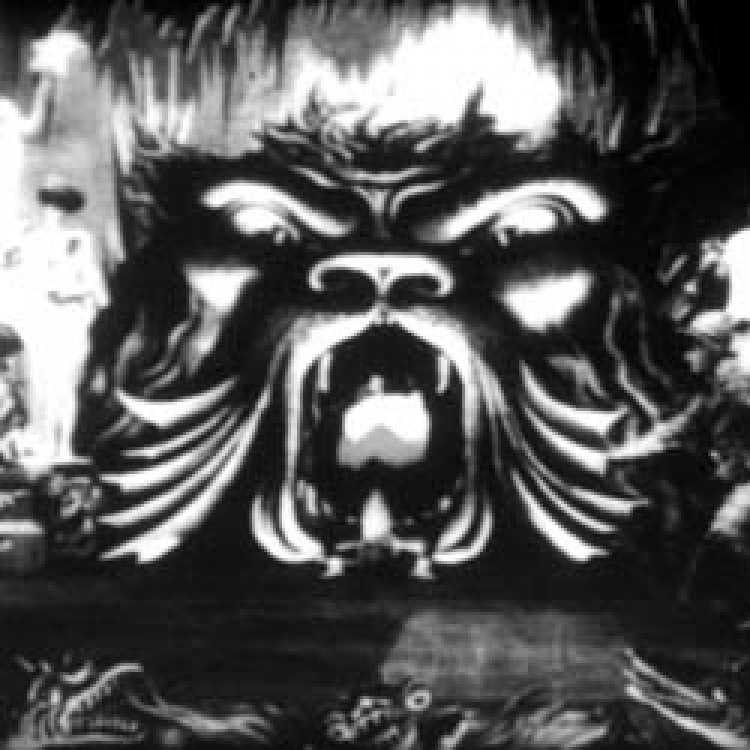 He gave the well-known story a satirical edge and hired Méliès to create two film sequences to be projected as part of the show. (An “actors go offstage and their adventures are shown onscreen” sort of deal.) 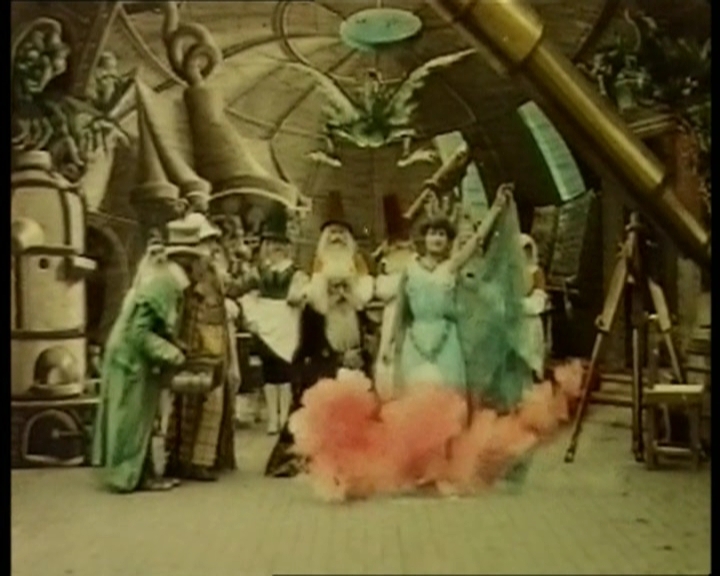 Méliès would incorporate one of the sequences, Le Voyage dans l’éspace (The Space Trip), into his Merry Frolics of Satan–filmed six months later. Fun fact: the scene set in the inn’s kitchen is a reproduction of the traditional set and special effects that had been used for Les Pilules du diable since 1839. If you have any French blood, you’re seeing something your ancestors might’ve watched on a Paris stage many generations ago. So while it’s true that Méliès would often resort to tried-and-true stage techniques in his films, it may be because at times they were literally meant for the stage. Take a look at The Merry Frolics of Satan below! And to see it in its clearer glory, I highly recommend Flicker Alley’s magnificent Méliès set. Dulac, Nicolas, Andre Gaudreault, and Santiago Hidalgo, eds. A Companion to Early Cinema. UK: John Wiley & Sons, 2012. Fell, John L., ed. Film Before Griffith. Berkeley and Los Angeles: University of California Press, 1983. This entry was posted in Obscure Films and tagged 1900s, French cinema, French theater, Georges Méliès, Méliès Month, Melies by Lea S.. Bookmark the permalink. This is my first time seeing this. What a spectacle! Yes, I agree, the ride through space with the celestial objects is definitely the highlight. The thought stuck me as I watched that it is amazing how much effort Méliès would have had to put into these fantasies. The sheer enjoyment he must have had definitely comes through in the final product. What kind of score is there on the Flicker Alley set? Does it include the narration. I prefer it without, though I understand that it’s actually historically correct. The Flicker Alley set is interesting, as I recall (I got the DVDs through Netflix a couple times) it’s set up so the films play as if you’re in an audience watching a 1900s era moving picture show. There’s traditional music, but I don’t recall narration (some audience noises maybe). Thanks. I may have to check out that set. I have the Kino single disk—well done, but the assortment they chose seems odd. It’s been a while since I’ve watched this one, but it is one of the standouts among Melies’ “longer” movies. Thanks for the research and thoughts! Thanks Lea for your background research on this film’s theatrical history. I enjoy your blog very much, and it has inspired me to go to the special showing of Méliès films at the Old Town Music Hall in El Segundo, CA this coming Sunday. I have a busy weekend of old film screenings! That coach is astounding! Thank you for sharing your insights into this amazing film! Isn’t it the greatest? Thank YOU for stopping by!